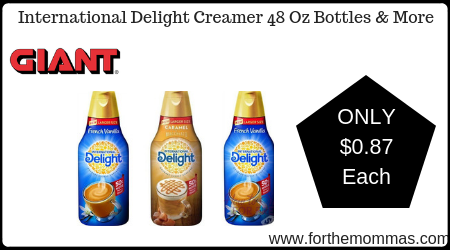 Giant: International Delight Creamer 48 Oz Bottles & More ONLY $0.87 Each Starting 2/15! Starting 2/15, Giant has a great deal on International Delight Creamers 48 oz and Ling Ling Ramen Noodles 48 oz. They are priced at $3.99 each, plus you will earn $12.50 in gas reward points that will make the final price just $0.87 each!